"Allen Toussaint for his contributions as a composer, producer, and performer. Born and raised in New Orleans, Mr. Toussaint has built a legendary career alongside America's finest musicians, sustaining his city's rich tradition of rhythm and blues and lifting it to the national stage." May 18, 2013 Allen Toussaint along with Dr. John, received honorary doctorate of fine arts, Natasha Trethewey, the United States poet laureate and winner of the Pulitzer Prize for poetry and His Holiness the 14th Dalai Lama received doctor of humane letters. Congratulation to The Southern Knight! Elvis Costello, Dr. John, Art Neville, Irma Thomas, Cyril Neville, Deacon John, Rosebud artist, Jon Clearyand more will perform at "Tribute to Toussaint," a benefit concert and tribute to Allen Toussaint celebrating his 75th birthday as well as his legacy and influence as a songwriter, performer, and producer. The event will be held at Harrah's Theater in New Orleans on April 30, 2013 at 8:30pm. Proceeds from the event will benefit New Orleans Artists Against Hunger & Homelessness, a non-profit organization that Toussaint co-founded with Aaron Neville in 1985. Toussaint has a history of working or performing with each of the artists involved in the tribute over the course of his long and highly influential career which includes multiple Grammy nominations and a Grammy Trustees Award, as well as induction into the Rock and Roll Hall of Fame, the Blues Hall of Fame, and the Louisiana Music Hall of Fame. Toussaint himself is also expected to perform at the event where LAE Productions and WLAE-TV will be filming for their upcoming documentary about Toussaint. For more information and to purchase tickets, please visit noaahh.org. 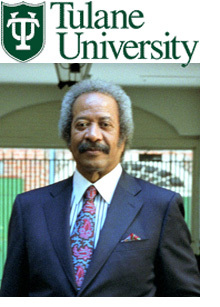 Allen Toussaint will receive an honorary doctorate degree of Fine Arts at Tulane University's commencement ceremony on May 18th, 2013. Others receiving honorary degrees at this year's ceremony include Dr. John, The Dalai Lama and Pulitzer Prize winner, Natasha Trethewey. His Holiness The Dalai Lama will give the keynote address at the commencement ceremony which will take place at the Mercedes-Benz Superdome. The Honorary Doctorate Award is the highest award that Tulane University confers, and it is given "to individuals who have distinguished themselves through extraordinary achievements" and to "recognize outstanding civic engagement that advances Tulane, New Orleans, the Gulf Coast or the world." 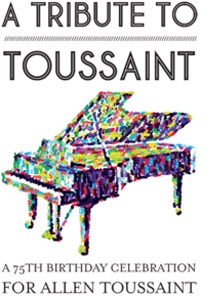 Some of Toussaint's past accolades include induction into the Rock and Roll Hall of Fame, Blues Hall of Fame, and Louisiana Music Hall of Fame; multiple GRAMMY nominations, and a GRAMMY Trustees Award. Actively touring the US and abroad, Toussaint continues his influential work and efforts to spread the musical culture of New Orleans. "when I meet someone like Allen Toussaint - that for me is like meeting, you know, someone the equivalent of the Dalai Lama because for me, he influenced the way I played the piano, he's a historical part of rock and roll." At a star-studded gala at the Marriott Marquis Hotel in New York on Thursday night, legendary singer/pianist/songwriter and record producer Allen Toussaint was inducted into the prestigious Songwriters Hall Of Fame. Veteran rock star Boz Scaggs walked out on stage and sang “Hercules”, Allen’s timeless parable about survival in the modern world which had been a highlight of Boz’s fourth Columbia album “Slow Dancer” back in 1974. Mr. Toussaint then joined him on stage to accompany on piano as Boz sang “Hello My Lover”, another of Allen’s songs which he’d previously recorded but which had started out life on a 1960 single by the late Ernie K-Doe. The Scaggs/Toussaint set then finished with the two of them duetting on “What Do You Want The Girl To Do”, one of the standout songs from Allen’s landmark 1975Reprise album “Southern Nights”. Boz then officially presented Allen with his Award and the SRO audience rose to their feet and applauded in heartfelt appreciation.